I was riding home on a packed commuter train the other day and decided I would conduct an experiment. What could I find out about the personal details of one of the people in my seating area of six just by using my phone and whilst on the train. One of them happened to be reading a printed email with their name on so I went to work. Within a couple of minutes I had worked out which town they lived, which company they worked for, what they did for that company. I also knew their interests, hobbies and saw photos of the persons last summer vacation. I also knew their partners and kids names and where some of their relatives lived. It was simple because I could work out that the person most likely lived in New York or Connecticut given the train we were on. That, with their name is all I needed. This small story gives a clear picture of power and the curse of the age we live in. We have access to data unlike any time in human history. Having been fortunate to have been a teenager at the very beginning of personal computing it is so exciting to me see my dreams in college come to fruition. Online unlimited information - encyclopedias, maps, videos, communication, collaboration it is quite amazing what has happened in the past 30 years. This explosion in power can be used to do so much good as well as bad. As human beings we will surely go down all avenues of opportunity. At the root of our future in my view is the sanctity and value of our identity. I am afraid with all the great things technology has achieved in the past few decades we have not solved how to be sure of and protect someone’s identity. How many passwords for web sites do you have to remember? For those important sites how often do you have to deal with the hassle of 2 factor authentication? When you want to buy something online how often do you have to enter your credit card online? How many times has your credit card been replaced because your card company tells you there has been a fraud? Has the number of times this has happened increased in the last couple of years? Have you figured out yet that anything you get for free on internet is actually just selling data about you so they can advertise back to you? Has it ever occurred to you that in times of pervasive technology you still have a paper/plastic passport and driving license and you have to queue up, often for an extended time, to have it ‘checked’ by a human being? I am sorry, dear reader, I dont have the answer to this problem but I fear we wont get a resolution soon because it is not in the interests of the current slew of technology companies for us to have this important feature. Should such a mechanism be run by the government...which one? The business of outrage and why we are being duped! In my previous post I talked about my disatisfaction with watching sport in the US and how it is being overtaken by advertising. This concern is minor, however, in comparison to my next thesis which is that we are all being dragged into feelings of outrage and anger by the same advertising and media businesses. Some of these companies, are, in my view, actually in the business of creating outrage and selling advertising off the back of it. Before we go any further I am not going to get dragged into a discussion about my political views. This is irrelevant to this post. I feel that media organizations claiming to represent each side of the American political divide are equally culpable. Lets take Fox News as an example. I pick them, not for any reason other than because they are the most popular cable news channel by some distance over the others. They know their audience. Watch for any period of time and the adverts you will see are for medicines, old age homes, long term investments such as silver, walking sticks, luxury cars etc etc. They have no shortage of advertisers and, as a result, they are very profitable. If you were running Fox News how would you maximize the advertising revenue for your company? You would create lots of content that would compel your target audience to keep watching as long as possible so they see as many adverts as possible. They run news 24 hours a day and therefore there is a lot of ‘news’ that is required to be able to create such ‘stickiness’ with viewers. Do do this...you would create as much controversy and outrage with your audience as possible in 24 hours. Get everyone to examine, discuss, tweet etc about the subjects you raise and then the next day start the whole process again. The best possible scenario being that the previous days items is sufficiently ‘news worthy’ to need more that 24 hours of coverage. Does this sound familiar? So if you take the perspective of FOX, CNN, CNBC, Huffington Post, Washington Post etc etc they need as much outrage from all of us as possible so they can generate revenue. It has got so bad that even what each ‘news’ organization is saying is part of the news cycle. You know that things are bad when this happens. My advice, try hard not to get outraged and fall into their trap. If you do, then all you are doing is handing the owners of the news groups more money ultimately out of your pocket when you pay for the products doing the advertising! A rant about advertising...rise up and resist! Recently it has occurred to me that I only watch live TV for two things - Sports and News. Everything else is on demand via the internet or DVR. Anyone who knows me well knows that I am happy when watching Football, Soccer, Golf, Car racing, Boxing...almost any sporting competition. However my enjoyment is severely hampered because watching some of the major sports on TV compels me to suffer endless adverts. Lets be clear I am happy to be sold to. If a product is of interest to me then I will actually spend time researching and then if appropriate purchasing. But with live sport there is a constant bombardment of endless mindless adverts for the same products that simply just put me off. I have created a long list of products that I have sworn to avoid simply because of the amount of advertising they insist I watch. The most annoying are adverts for cars. Each one of them promises a happier, more fulfilling life with images of their car racing around courses with professional drivers interpersed with pictures of famous actors and/or scantily dressed women. I can safely say that as a result of these adverts I will go out of my way to avoid buying, amongst others a Cadillac, Acura, and Lincoln. What is even more annoying is the same advert playing over and over again, sometimes directly one after another! Samsung has driven me crazy with the same ‘can’/‘cant’ advert associated with the 2018 winter Olympics. My next TV will not be a Samsung even though I am very happy with the ones I already have. It’s very frustrating and, especially, with the NFL (another article I will write later), takes away a proportion of the enjoyment of the event in the first place. I am sure, that I am not alone in having these feelings. I am also fairly sure that the advertisers dont care that I feel this way. Phsycologists are likely advising their clients that they should keep pushing their products on me because brand recognition is actually the really important part of the process not my overal satisfaction of the experience of watching the sporting event and the association of their product with it. I feel like we are being treated like laboratory animals being fed the same message over and over again thinking that it really will affect my purchasing choices. What is depressing is that it must work, people must end up buying the product otherwise they wouldn’t do it right? So I say rise up and fight dear reader...dont let yourself be influenced by the brainwashing. Make a note of the annoying adverts and create a pact with yourself never to buy any of the products from those advertisers. If each of us do this then adverts will be less effective and perhaps sports will not be constantly interrupted by mindless adverts. Only with this show of resistance will we get a pleasant sport watching experience back again. So fight with me - make your list! Today I often read about how internet retail is going to destroy the high street and the shopping malls of America. In fact, the headlines are very similar to what was said about how the malls were going to do to the high street shops in the 80’s. In my travels around America almost every high street, mall and strip mall have exactly the same shops with the same products. Now, this is good in some ways...I can walk into a CVS in my home town or in any other town and be confident that I will get close to the same products and prices. This strength is also a great weakness. These same ‘national’ chains have pushed out retail innovation so much that there is nothing left for the specialist shops where one can buy a more unique product that makes everyone a little different and ‘special’. The shopping experience, in general, is unimaginative and mundane. If I want to buy basic products like toothpaste, razors, cleaning fluid, washing powder etc etc I want to be able to do it on line. I don’t want to have waste my valuable time going out to buy such day to day products. I want to get out my phone or computer and order them in a few minutes. So I am delighted when I read about Amazon killing todays retailers. I want them all wiped out as soon as possible! So lets just imagine my wish comes true...what happens then? The opportunity for local, specialist retailers comes back to life again. Because of the reducerd demand for retail space rents will fall. Furthermore, the very infrastructure that allows Amazon and large organizations to be so cost effective will also allow the smaller retailer to be more innovative and still make products available for a reasonable price. They can get basic supplies cheaply and on-line. Products can made cheaply overseas even for smaller quantities. Creative work is also available via online services. For example you don’t need to have huge capital investment to make specialist line of clothing is was so in the past. Yes, what is made wont be as cheap as the basic clothes available on line but they will be more unique and, I am predicting, more in demand precisely for their uniqueness. The same is applicable, but perhaps not to the same extent, with food. I predict that, over time, with the development of the online experience of purchasing basic food supplies, the standard, lower end supermarkets will have no way to make a profit. As a result the the large household brands of today will have no choice but to go solely on line. Their future is all about differentiation through advertising and brand recognition...that is all. But this change will give an opportunity for local specialist food sellers bakers, butchers etc etc. They will use local products wherever possible and have a limited supply, but they will know their products inside out and the service will be individual and face to face. Does all this sound familiar? Like the retail high street of the past? Lets be clear I am not lamenting the past and wishing for a return. I am actually looking for a high street to be rid of the common products and be focused more on the unique and artisan...where we can go and spend time in shops to explore and discover rather than get in and out as fast as possible. I look forward to these days ahead...perhaps some time away but I feel confident they are coming! A few months ago my daughter told me that she was going to a live concert at the O2 in London. My immediate thought was that she was going to see one of the new bands that she continually ’educates’ me about. But to my surprise she announced she was going to see Queen. Queen were producing greatest hits albums when I was her age! When we go on long road trips as a family we often do 'pass the Phone' to allow everyone to have a go at selecting the music. I am constantly surprised how many times my kids select what I would call older music - David Bowie, ELO, Prince, AC DC, Michael Jackson etc etc. In fact I am often lambasted for my choice of newer pop songs…the kids detest Bieber, T Swift et al. What is going on?! But when I sat back and thought about it this all makes sense. My kids have access to huge libraries of music that just didn't exist when I was their age. I remember that at their age, I only owned about 8-10 albums and maybe 15-20 singles. Over many plays, these records used to get so damaged that I would sing along with the scratches because I knew each track back to front. I would have to save up my pocket money in order to go and buy the record I wanted and would make a trip with my friends to the record store and rush home to listen. It was an event! Because of this automatic restriction on consumption we had no choice but to select only certain types of music. There was simply not enough money available to create an eclectic taste. My theory is that this is where the cliques came from...Punk, Mod, Rockers etc. - all part of teenage desire to belong and rebel. Now there are no restrictions in this vast online catalogue, so this is why there are not the same fashions based on music as there were in the past...you just don’t see so many Goths, Romantics or modern day equivalents. Since music and fashion used to be so tightly coupled I think the lack of really innovative new fashions are a function of the lack of new creative types of music. I think it is amazing that my children have access to virtually every major artist and album ever made! Their tastes are now very eclectic, a real mix of old and new. Apple watch so what's it like? I was given an Apple Watch as a gift on my birthday in June. I have been wearing it every day since and have spent time using a lot of its features and available apps. I have to admit that I was not planning to buy a watch when it came out. However, having used it for a couple of months I have grown attached to a number of its features. Essentially its benefits are the sum of a small number of conveniences. None of them individually would make you buy a watch but collectively they make something that is useful and quite valuable. Music and Bluetooth headphones - I am big runner and I love being able to download music to my watch and then listening using Bluetooth headphones. This means I don't need to carry my phone or any other device. Very convenient. Mapmyrun - simple use but for my longer runs i.e over 5 miles I really like to use the mapmyrun app. This is great because I can listen to my latest book, music, or podcast on my iPhone and the app gives me mile by mile splits and time updates. The watch is handy because I can easily start and stop my run with my watch. I generally run with a camelpak and put my phone in it. Before the watch if I wanted to take a quick break on the run I would have to scrabble about getting the phone out of the pocket and pausing the run. Siri to play music - I really like to be able to talk to my watch to play music of my choice while driving rather than looking down to pick up my phone and talking. I don't have to my eye off the road at any time. Passbook - Like Apple pay I make use of the watch passbook app. I use it primarily to pay for Starbucks coffees and get into Equinox gym. Sometimes the bar code on the watch is too small for other uses e.g. Had to get out my phone to get into the cinema via Fandago. Notifications - I took some time to go through all my iPhone notifications and rationalize only what I really want to see on the phone. So I have one news source, text/iMessage, my bank/credit card, and notifications about rain coming. Swim - if there was one feature that would make this device a slam dunk for me would be if it were waterproof so I could swim whilst wearing the watch. Frankly I never want to take my watch off except to charge. Podcasts & Audible books downloaded on watch - would love to be able to only use my watch on longer runs. To do this I would like to be able to download a few podcasts and the book I cam currently listening to. Battery life - this works well. I have generally around 40% when I go to bed at night and put it on to charge. RTFM - You need to read the manual to understand how to make best use of the watch. Do not download all apps when you set up - I heard this on one of my tech podcasts before I got my watch. It was a good recommendation because you really don't want many icons on your watch. Just put on what you are going to use...leave the rest of the junk. Carefully set your notifications - As I stated above if you don't do this you will constantly be getting dinged for stuff that you need or want. On our road trip last July we spent a couple of days in Aspen, Colorado. As you will see in other posts on this side we have spent many of our winter/spring and some summer vacations in this beautiful town. 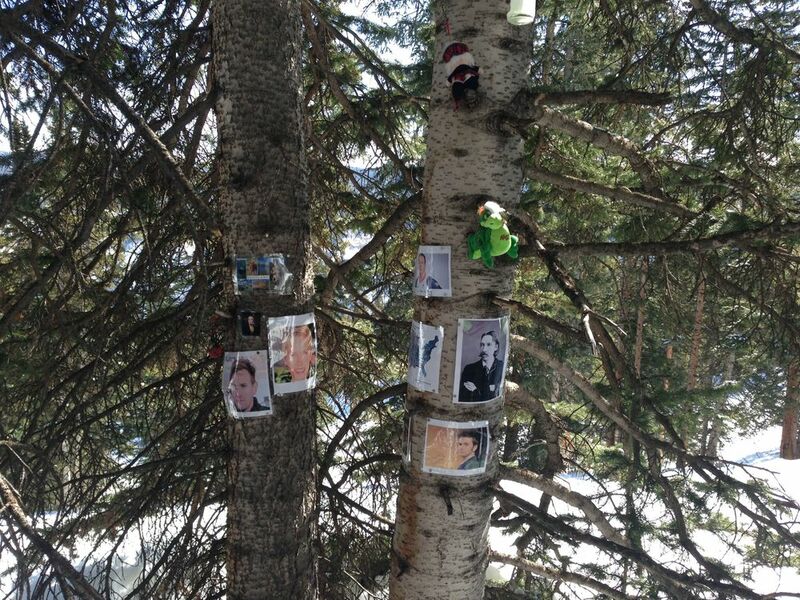 If you spend time skiing with guides and locals they will likely show you 'shrines' hidden in the trees on the four ski mountains of: Aspen Mountain, Aspen Highlands, Buttermilk, and Snowmass. Famous examples include 9/11, Marilyn Monroe, and John Denver. There is a bigger listing on the web here and there is even a book you can buy! The gallery has some more photos here. Take a look at some of the fantatstic landscape pictures Ana took while we were on our summer holiday this year.